A great article featured on the Social Media Today blog got us thinking about all the ways to use social media, and all the ways it can go wrong. Commentary on social media etiquette has been present far and wide for a few years now and yet the messages don’t seem to be getting through. We can’t get through a day or even a few hours without hearing about a criminal apprehended as a result of an unintentional confession on Facebook or a high-profile figure under fire for a spontaneous, and poorly-worded, tweet. Has social media really made it that much easier for all of us to mess up? In some ways, yes, but the ever-changing realm of communication is not entirely to blame. While the playing field has seen a complete remodel, all the same rules are still intact. The idea that Google, or the Internet more generally, is the new resume is one that has been the topic of many presentations and also one that we feel warrants repetition. A painstakingly worded resume may find its way to the top of the pile only to be at the bottom of the trash bin moments later if a certain Google hit is deemed inappropriate. It should go without saying that this same scenario can repeat itself when developing relationships with prospective clients. 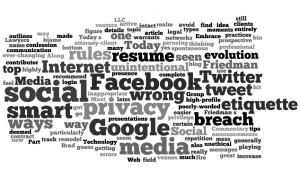 Brad Friedman, President of The Friedman Group, LLC and Social Media Today contributor, outlines how an active social media presence can, when used unwisely, lead to unethical practices in “Lawyers Must Embrace Today’s Technology & Web 2.0 Part 1”. Along with the evolution of social networks we have seen an increase in venues for breach of contract, privacy, attorney-client privilege, you name it, but we’d venture a guess that it doesn’t have to be this way. There are no announcements at the top of Facebook, Twitter or any other site that reads “Please share your innermost feelings below” or, “Forget everything you’ve learned about privacy here” and yet most of us have an urge to do just that when we login. The bottom line that we have arrived at: be smart. For more details on how to avoid any of these types of errors, particularly as a legal professional, we highly recommend perusing Friedman’s tips.